What I know about football as a sport could be written on the back of a small postage stamp but I do take a passing interest in the business side. However, over the last few days it has been impossible to ignore the news in relation to the on pitch actions of Liverpool player Louis Suárez, biting a player from the opposing team during the match last weekend. It astounds me that there has been so much defence of his actions from Liverpool FC. Whilst he presumably is a good player who helps them achieve their goal of winning games in my view his actions are indefensible. In a business situation any employee (which is what Suárez is, albeit a very well paid one) who did something similar would almost certainly be instantly dismissed and probably charged with a criminal action which would make the chance of future employment very difficult, this would probably be absolutely deserved. The fact that this is a repeat offence would make this even more deserved. Apart from anything else, the offender would be dismissed to demonstrate to all the employees that such behaviour is unacceptable. However, Suárez and Liverpool FC are saying the 10 match ban imposed by the FA is unfair and undeserved - Liverpool FC saying it was "shocked and disappointed at the severity". Apparently Suárez may even leave the UK and take up an offer from a club elsewhere in the world. The 10 match ban is from the English football association. Surely FIFA, the international body, should use their position to show that this type of behaviour is unacceptable within the game they regulate. 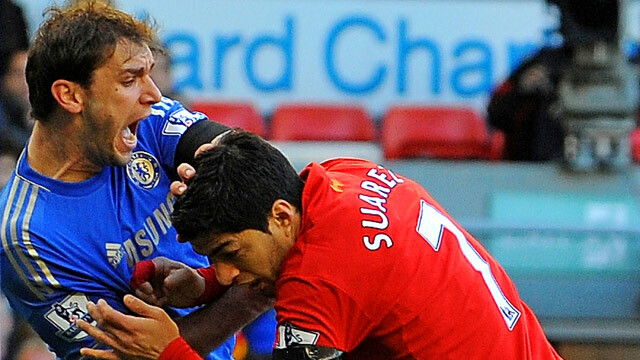 If the club he plays for (Liverpool FC) are not prepared to take the action which would happen to any employee of an organisation in the EU for doing what Suárez did, then in my view FIFA should ban Suárez internationally for a period long enough to show him and any other player now and in the future that this is unacceptable behaviour. That would demonstrate that footballers are not above the ethical standards expected in life, no matter how good they are. Does anyone think that footballers should be given exemptions from normal behaviour? It is no doubt all about the money for Liverpool FC, but an analogy from the business world would be supermarkets saying that having horse meat included in beef products is OK because the food is still good and they make more money that way.